Hobbes' mechanism: "Reason is nothing but reckoning." The first step to answering the question is to clearly define "intelligence." 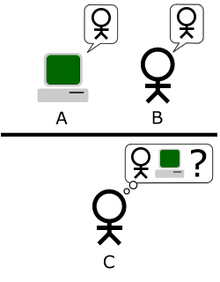 One criticism of the Turing test is that it is explicitly anthropomorphic. If our ultimate goal is to create machines that are more intelligent than people, why should we insist that our machines must closely resemble people? Russell and Norvig write that "aeronautical engineering texts do not define the goal of their field as 'making machines that fly so exactly like pigeons that they can fool other pigeons.'" Recent AI research defines intelligence in terms of intelligent agents. An "agent" is something which perceives and acts in an environment. A "performance measure" defines what counts as success for the agent. Definitions like this one try to capture the essence of intelligence.. They have the advantage that, unlike the Turing test, they do not also test for human traits that we may not want to consider intelligent, like the ability to be insulted or the temptation to lie. They have the disadvantage that they fail to make the commonsense differentiation between "things that think" and "things that do not". By this definition, even a thermostat has a rudimentary intelligence. Hubert Dreyfus describes this argument as claiming that "if the nervous system obeys the laws of physics and chemistry, which we have every reason to suppose it does, then .... we ... ought to be able to reproduce the behavior of the nervous system with some physical device." This argument, first introduced as early as 1943 and vividly described by Hans Moravec in 1988, is now associated with futurist Ray Kurzweil, who estimates that computer power will be sufficient for a complete brain simulation by the year 2029. A non-real-time simulation of a thalamocortical model that has the size of the human brain (1011 neurons) was performed in 2005 and it took 50 days to simulate 1 second of brain dynamics on a cluster of 27 processors (see also ). Few disagree that a brain simulation is possible in theory, even critics of AI such as Hubert Dreyfus and John Searle. However, Searle points out that, in principle, anything can be simulated by a computer; thus, bringing the definition to its breaking point leads to the conclusion that any process at all can technically be considered "computation". "What we wanted to know is what distinguishes the mind from thermostats and livers," he writes. Thus, merely mimicking the functioning of a brain would in itself be an admission of ignorance regarding intelligence and the nature of the mind. In 1931, Kurt Gödel proved with an incompleteness theorem that it is always possible to construct a "Gödel statement" that a given consistent formal system of logic (such as a high-level symbol manipulation program) could not prove. Despite being a true statement, the constructed Gödel statement is unprovable in the given system. (The truth of the constructed Gödel statement is contingent on the consistency of the given system; applying the same process to a subtly inconsistent system will appear to succeed, but will actually yield a false "Gödel statement" instead.) More speculatively, Gödel conjectured that the human mind can correctly eventually determine the truth or falsity of any well-grounded mathematical statement (including any possible Gödel statement), and that therefore the human mind's power is not reducible to a mechanism. Philosopher John Lucas (since 1961) and Roger Penrose (since 1989) have championed this philosophical anti-mechanist argument. Gödelian anti-mechanist arguments tend to rely on the innocuous-seeming claim that a system of human mathematicians (or some idealization of human mathematicians) is both consistent (completely free of error) and believes fully in its own consistency (and can make all logical inferences that follow from its own consistency, including belief in its Gödel statement). This is provably impossible for a Turing machine (and, by an informal extension, any known type of mechanical computer) to do; therefore, the Gödelian concludes that human reasoning is too powerful to be captured in a machine. More pragmatically, Russell and Norvig note that Gödel's argument only applies to what can theoretically be proved, given an infinite amount of memory and time. In practice, real machines (including humans) have finite resources and will have difficulty proving many theorems. It is not necessary to prove everything in order to be intelligent. After concluding that human reasoning is non-computable, Penrose went on to controversially speculate that some kind of hypothetical non-computable processes involving the collapse of quantum mechanical states give humans a special advantage over existing computers. Existing quantum computers are only capable of reducing the complexity of Turing computable tasks and are still restricted to tasks within the scope of Turing machines. See Quantum computer - relation to computational complexity theory. By Penrose and Lucas's arguments, existing quantum computers are not sufficient, so Penrose seeks for some other process involving new physics, for instance quantum gravity which might manifest new physics at the scale of the Plank mass via spontaneous quantum collapse of the wave function. These states, he suggested, occur both within neurons and also spanning more than one neuron. However, other scientists point out that there is no plausible organic mechanism in the brain for harnessing any sort of quantum computation, and furthermore that the timescale of quantum decoherence seems too fast to influence neuron firing. Russell and Norvig point out that, in the years since Dreyfus published his critique, progress has been made towards discovering the "rules" that govern unconscious reasoning. 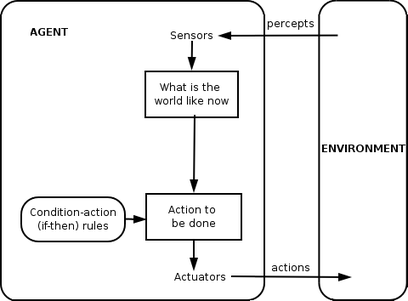 The situated movement in robotics research attempts to capture our unconscious skills at perception and attention. Computational intelligence paradigms, such as neural nets, evolutionary algorithms and so on are mostly directed at simulated unconscious reasoning and learning. Statistical approaches to AI can make predictions which approach the accuracy of human intuitive guesses. Research into commonsense knowledge has focused on reproducing the "background" or context of knowledge. In fact, AI research in general has moved away from high level symbol manipulation or "GOFAI", towards new models that are intended to capture more of our unconscious reasoning. Historian and AI researcher Daniel Crevier wrote that "time has proven the accuracy and perceptiveness of some of Dreyfus's comments. Had he formulated them less aggressively, constructive actions they suggested might have been taken much earlier." The words "mind" and "consciousness" are used by different communities in different ways. Some new age thinkers, for example, use the word "consciousness" to describe something similar to Bergson's "élan vital": an invisible, energetic fluid that permeates life and especially the mind. Science fiction writers use the word to describe some essential property that makes us human: a machine or alien that is "conscious" will be presented as a fully human character, with intelligence, desires, will, insight, pride and so on. (Science fiction writers also use the words "sentience", "sapience," "self-awareness" or "ghost" - as in the Ghost in the Shell manga and anime series - to describe this essential human property). For others, the words "mind" or "consciousness" are used as a kind of secular synonym for the soul. Gottfried Leibniz made essentially the same argument as Searle in 1714, using the thought experiment of expanding the brain until it was the size of a mill. In 1974, Lawrence Davis imagined duplicating the brain using telephone lines and offices staffed by people, and in 1978 Ned Block envisioned the entire population of China involved in such a brain simulation. This thought experiment is called "the Chinese Nation" or "the Chinese Gym". Ned Block also proposed his "blockhead" argument, which is a version of the Chinese room in which the program has been re-factored into a simple set of rules of the form "see this, do that", removing all mystery from the program. "Self awareness", as noted above, is sometimes used by science fiction writers as a name for the essential human property that makes a character fully human. Turing strips away all other properties of human beings and reduces the question to "can a machine be the subject of its own thought?" Can it think about itself? Viewed in this way, it is obvious that a program can be written that can report on its own internal states, such as a debugger. The very concept of AI is incoherent (Searle). ↑ Eugene Izhikevich (2005-10-27). "Eugene M. Izhikevich, Large-Scale Simulation of the Human Brain". Vesicle.nsi.edu. Retrieved 2010-07-29. ↑ Russell & Norvig 2003, p. 950. They point out that real machines with finite memory can be modeled using propositional logic, which is formally decidable, and Gödel's argument does not apply to them at all. McCarthy, John; Minsky, Marvin; Rochester, Nathan; Shannon, Claude (1955), A Proposal for the Dartmouth Summer Research Project on Artificial Intelligence .